2005 Elections are currently being held for the Texas Thoroughbred HBPA, Inc. (TTHBPA) Board of Directors and the Texas Horsemen's Benevolent and Protective Association's (THBPA) Board of Directors. The TTHBPA board is conducting an election for two Thoroughbred owners and one Thoroughbred trainer, and the THBPA (Quarter & Paint Horse board) is also conducting an election for two owners and one trainer. The deadline for the Texas Thoroughbred HBPA's 2005 (Thoroughbred) Election will be drawing to a close very soon. Ballots were sent to the respective membership roster in November. Ballots must be received no later than Monday, December 13, 2004. In order to be eligible to vote you must be a member in good standing (i.e. ; currently licensed by the Texas Racing Commission as an owner or trainer or combination thereof and own at least 5% or more of a racehorse that has started within the past 12 months) of the Texas Thoroughbred HBPA, Inc.
Click here to see Thoroughbred Owner & Trainer candidate biographies and photographs. The Texas Horsemen's Benevolent and Protective Association 2005 election is also underway. 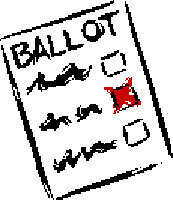 Ballots were sent to the membership in late November and must be received back by Monday, December 27, 2004. To be eligible to vote in this election, you must be a member in good standing of the Texas Horsemen's Benevolent and Protective Association (i.e. currently licensed by the Texas Racing Commission as an owner or trainer or combination thereof and own a racehorse that has started in Texas within the past 12 months). Click here to see Quarter/Paint Horse Owner and Trainer candidate biographies and photographs. Any eligible member in good standing that did not receive a voting ballot and wishes to do so should contact Wanda O'Banan at (512) 467-9799.